Melissa and I are done our bags early this week so we thought we'd do a little round of show and tell. 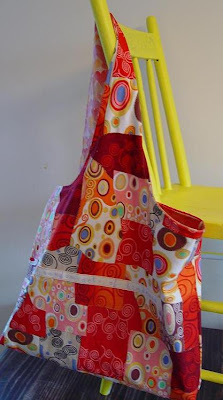 Week Two's Sew What challenge: a bag with words. I have been hoarding this fabulous Alexander Henry fabric for just this purpose. The inside is a journal print. I think it's lovely. I'm no whiz with denim, so I'll be sticking to cotton for the rest of my Sew What projects this month. 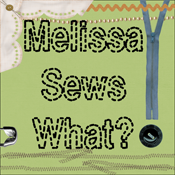 If you took the Sew What challenge too, upload your photos to my Flickr page for all the world to see, or email them to me and I'll post them here in a few days. Tutorials for the bag and the clutch can be found on my blog here and here. Wondering what the Week Three challenge is? Me too. Melissa is the brains behind the next one. Cute! How happy that tote will make you each time you look at it! Cheery colors & fabrics! What I love most about this challenge is how absolutely different each piece can turn out. Each of these are gorgeous! I cannot wait to see the other entrants! Hi, I'm relatively new to your blog. Love it, and like both bags, but what is the outer fabric on the clutch!? It's wonderful!